Have you developed your foolproof plan for getting Alexa, Siri, Cortana, or Google Home devices to speak your brand’s praises when customers come calling for advice? Are you fighting FOMO with a killer virtual reality app that turns your shopping experience into a garden of unearthly delights for consumers to explore? Have you budgeted for a new blockchain-based loyalty program or a celebrity-hosted influencer network promising fame and fortune to your audience in exchange for their ongoing engagement? Don’t panic about keeping up with progressive content trends like these. Remember while it’s tempting to pour all your content team’s energies and resources into the next big thing to hit the digital marketplace, sustainable, long-term success with content marketing first requires a mastery of the fundamentals. This updated toolkit – featuring some of CMI’s best tips, checklists, and templates – can help you build that solid foundation. 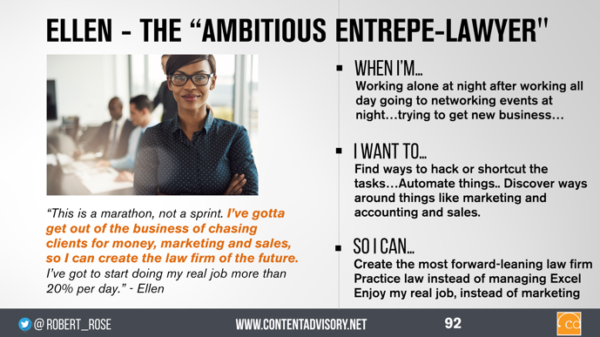 Use it to check off some of the critical content marketing tasks on your to-do list more efficiently and use the newly freed brainpower to innovate wisely and purposefully. Everything you do as a content marketer should flow from a deliberately constructed content marketing strategy. This includes determining how to model your content operations as well as outlining why you are creating content (your purpose), who you want it to reach (your audience), and the expected impact of your content efforts on the business (your goals). Think of your strategy as a road map of the content experience you intend to cultivate and how it will connect your business with your audience – and move both of you closer to achieving your goals. Player: Content marketing is seen as a contributor to other business communication strategies such as demand generation or product marketing. Performer: Content functions as a center of excellence, aiming to build an addressable audience through owned media platforms. Processor: Content is treated as a centralized service offered throughout the organization. Platform: Content is run as a self-sufficient yet fully integrated media business. Of course, content marketing can help your business achieve all these aims and more; but it works best when you focus on one challenge at a time. If your content program could only help your company achieve a single goal, what would you want it to be? To figure out which goals your organization should prioritize, try the steps in George Stenitzer’s one-page strategy guide. When you think of your content recipients in broad terms like “audience” or “targets,” it’s easy to lose sight of their needs as unique, complex people with different needs, interests, preferences, and behaviors. That’s where audience personas come into play. These composite sketches help characterize key segments of your audience in terms of their relevant challenges and concerns and the role they likely play in their company’s purchasing process. Define your target: Detail the total addressable audience. Discover the “so I can”: Uncover the functional and emotional jobs the audience needs to get done. Decide on your niche: Find your sweet spot of relevance – where your field of knowledge and your skill sets intersect with a passion point of your audience. 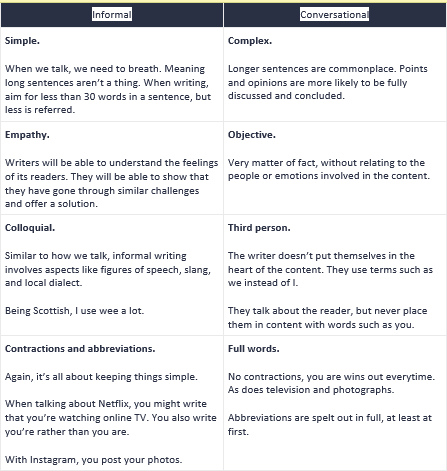 Differentiate your content approach: Prioritize the jobs to be done by those that you can and should solve with your unique and distinct point of view. Design your map of success: Identify as many of the kinds of value you can provide across each step of your chosen jobs to be done. A unique content marketing mission statement helps you document your company’s reason for creating content and the priorities and perspectives it will uphold in pursuit of that mission. Be succinct but don’t oversimplify: Describe your editorial mission clearly to prevent your content team and your readers from making assumptions about the purpose of your brand’s content. 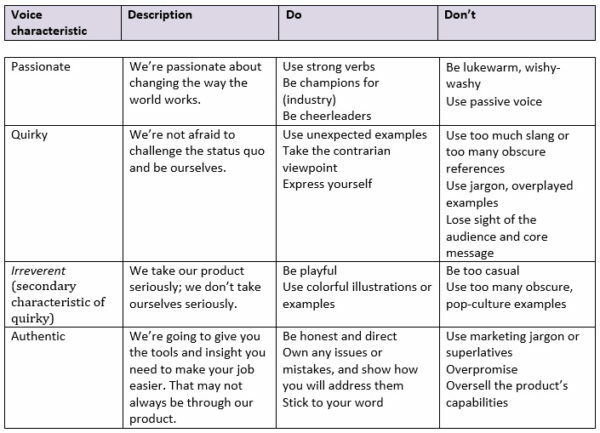 Don’t be generic: Distinguish your brand in the statement, whether it’s by geography, industry, niche, etc. Include your content’s purpose: Explain, in as few words as possible, how it should motivate the readers or viewers, and what you want them to know, think, or do as a result of consuming it. Pick a niche: Your content can’t be everything to everybody. 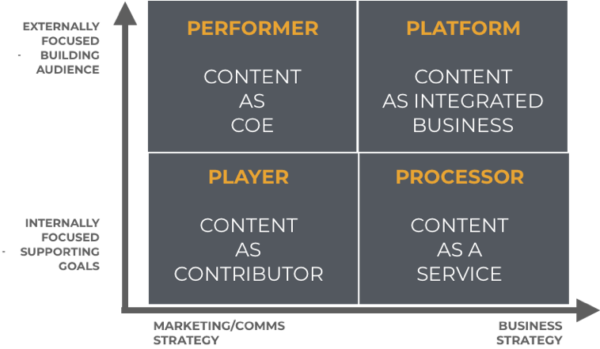 Pick an area of specialization and ensure that your content efforts all adhere to it. Unless your business is just launching, you probably have quite a few content pieces floating around the digital landscape. Some might be worth repurposing; others might no longer fit your goals and should be removed, revised, or replaced. Your first step for activating your strategy should be to take stock of existing content and determine whether it is still shining the best light on your brand. 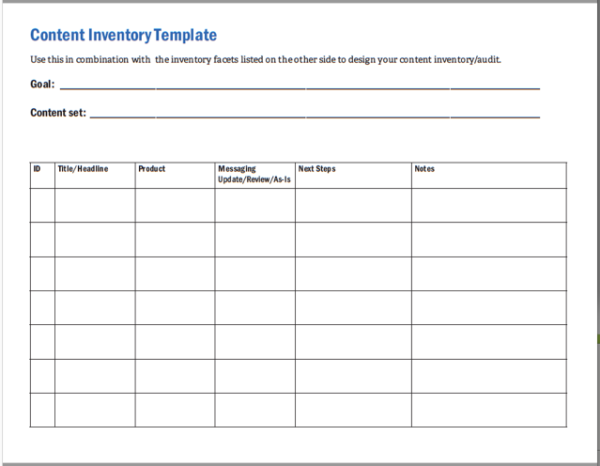 Content strategist Laura Creekmore shares a streamlined inventory and auditing process, including this template to help you focus in on the most useful data and observations. To ensure that your content reflects your brand, its purpose, and its values, enable your team to create each piece of content under a unified standard of quality – which includes maintaining a unique brand voice and consistent editorial style. Brand voice: Erika Heald has outlined a five-step process to establish and maintain a voice that will set your content apart from its competitors while remaining true to your brand’s core ideals. Gather a sample of your best content pieces. Include examples of all the types. Cast a critical eye on each piece, whittling the list to a small group of assets that represent what’s unique about your brand and embody the qualities that you outlined in your editorial mission. Describe your ideal brand voice in three words. Broadly categorize all the assets on your list into distinct themes. Select the three most dominant themes and describe their core qualities based on the characteristics your audience would most likely associate with them. Create a brand voice chart. Create a form (like the example below) to illustrate how each brand characteristic should be applied in your content. 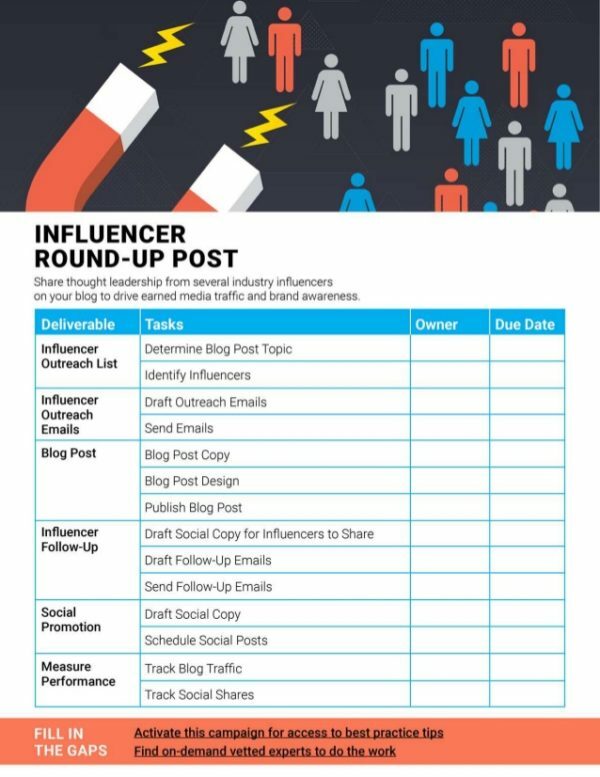 Walk your content creators through the chart to ensure that your team members all understand how to put your brand voice in action. Revisit and revise your chart as your business evolves. Baseline guide: Start with an existing style guide (like AP Style) as a baseline, then customize to align with your brand’s unique communication style. Formatting: Include details on how to format things like bullets, lists, hyphens, and quotes, and outline when those standards might be different – such as a content format (e.g., video, infographics) or content platforms (e.g., social media). Colors: Detail your brand’s palette of colors, including function. Make sure to include the hex, CMYK, and RGB codes for each color, as well as Pantone numbers. Logos: Include all versions of your logo and examples of proper usage in your most likely scenarios. Fonts: Include all brand fonts for headings, paragraphs, etc., and instructions on their usage. Templates: Include links to any company-branded templates (such as PowerPoint slideshows) and boilerplate information. To consistently produce high-quality content on multiple channels and platforms, you need to make sure everyone on your team understands your organization’s expectations and has the required skills and know-how to fulfill them. 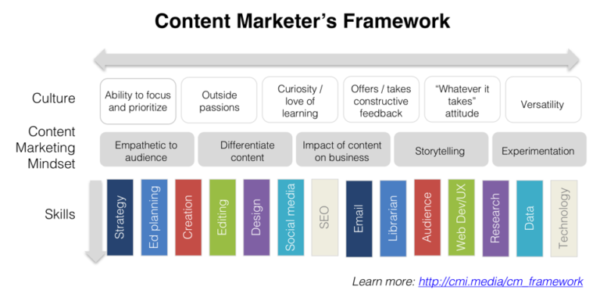 Use this team framework developed by Michele Linn to identify the skills, mindset, and cultural considerations to account for when running an efficient and effective content marketing program. No matter how creative and talented your team members and agency partners are, there are times when it may make sense to outsource writing – especially when you have a high volume to be done or specialized technical or subject matter expertise is needed but falls outside your team’s comfort zone. Writer job boards: Forums like Problogger, Writer’s Den, the Freelancer’s Union, LinkedIn Groups, or even Craigslist can be instrumental for connecting with potential writers. Freelancing platforms: Sites like Upwork, Fiverr, and Freelancer.com add automation to the mix, providing a centralized place for evaluating writers’ profiles, client reviews, and past work. 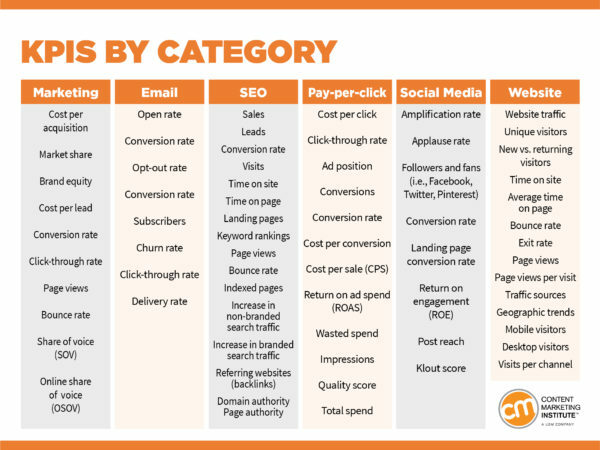 Content marketing platforms: Content platforms like Contently, Skyword, and NewsCred are pricier than other alternatives but potentially worth the cost because they curate their pool of writers and can provide an editor for quality assurance. Referrals and word of mouth: As a rule, the best writers rarely have to look for work – they’re inundated with clients starving for their unicorn-rare mixture of writing proficiency and industry expertise. The easiest way to find them is to ask around. Once you’ve set your strategy and outlined your plans for executing it, it’s time to create high-quality, customer-driven stories. Though the creative process is unique to every business, plenty of tools can help with generating story ideas, organizing them into relevant content pieces, and getting them into the hands of your target audience. A great creative brief provides a clear view of the project, the business challenge it is meant to address, and the value it aims to provide to your target audience. If everybody on the team understands their expectations from the get-go, it makes it easier for them to stay focused, channel their creativity, and collaborate effectively. 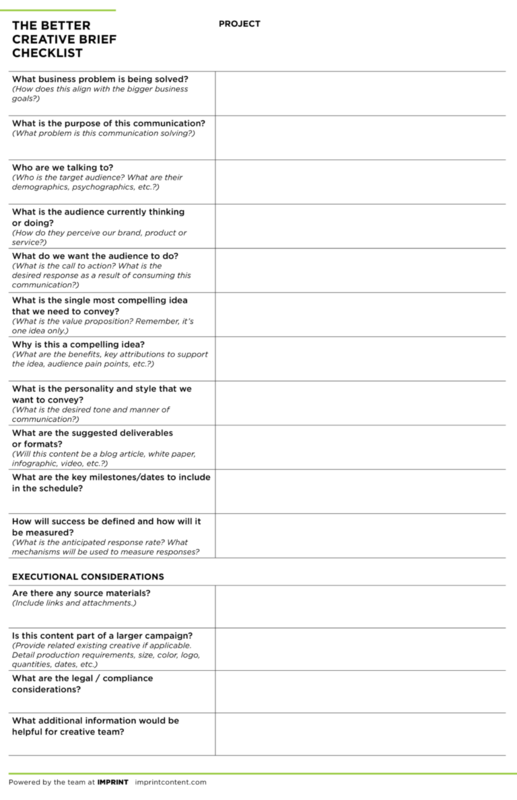 Use Duncan Milne’s creative brief template to guide your creative brief execution. Then, make sure to distribute it to everybody on your content team so they all work toward the same vision of success. Brainstorming is a great tool for getting the creative juices flowing and generating a high volume of new content ideas. There are a wide range of ways to approach this task, including the loosely organized free-association process Jay Acunzo recommends, and the five-step improv exercise Cisco Systems’ Tim Washer developed through his experience as a comedy writer. But, if you are looking for a more strategically guided method – one that prioritizes high-growth content projects over those that only provide incremental returns – consider experimenting with the 10x idea generation framework CoSchedule’s Garrett Moon has used to reach his marketing goals 10 times faster. Unless you live in a world where time and budget are unlimited, you need to prioritize the creative ideas that result from your brainstorms and determine which are most worth your team’s time and energies in producing. Thanks to search engines, any content you publish online will be findable forever – whether it stands the test of time or not. As you build your ideas into assets, you may want to focus on more evergreen types that will continue to benefit your brand long after it’s initially published. Mike Murray outlines the evergreen content formats he thinks offer the longest lifespans by design, as well as those that can be easily updated with fresh information as necessary. While all-purpose content is important to have, you can build your content efforts around specific or specialized business needs – like supporting your sales team’s efforts to address pressing customer challenges or bridging prospects’ critical knowledge gaps. 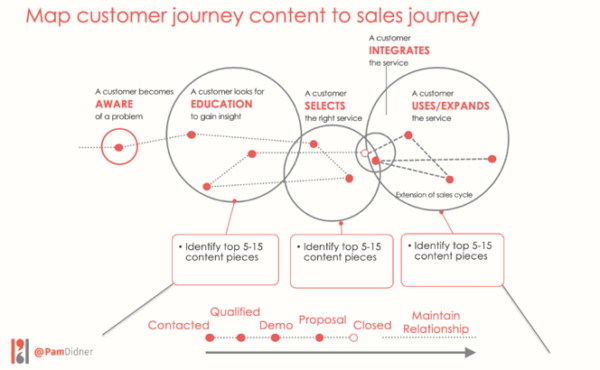 Follow the technique that Pam Didner has outlined for creating sales-driven (and sales-driving) content – which starts with mapping the customer journey to the sales journey. If your writers are focused on communicating key talking points instead of readable and relatable stories, you might grab the audience’s attention, but you won’t hold it for long – or earn their ongoing interest in what your brand has to say. Simply creating and publishing content online probably won’t be enough to get it discovered by the right consumers, let alone do so at scale. As a content marketer, you need to make thoughtful decisions about how and where to distribute your content, as well as how you boost your efforts’ chances of building authority and trust. As DivvyHQ’s co-creator Brody Dorland reminds us, without an effective and repeatable process for promoting your blog posts and maximizing their visibility, all the hard work creating them can go to waste. Fortunately, he shares an updated version of his future-proof checklist for promoting your blog that will help you cover all your bases. Figuring out the best places to share your content on social media can be puzzling as the rules, opportunities, audiences, and value propositions vary greatly from one channel to another – and can shift gears abruptly without a moment’s notice. But one thing that can make your decisions more straightforward is establishing a channel plan – an advanced directive for how your brand can and should distribute its content marketing efforts on rented channels like social media and what you expect to achieve. Another way to amplify your new content is by linking to it from your other high-performing content as well as popular and relevant third-party sites. Authoritative backlinks might be harder to earn than organic social shares; but as BuzzSumo’s Susan Moeller points out, they stay around longer than a tweet or a Facebook post, are easier to track than “dark-sharing” mechanisms like email and apps, and serve as a powerful Google ranking factor. Partnering with high-profile industry experts and public personalities for content distribution can help strengthen your company’s credibility and trustworthiness – a must for success. And with brands estimated to see an average ROI of $6.85 for every dollar invested in influencer marketing (Burst Media study), it may be one of the smartest bets around for successful content distribution. Building a robust influencer marketing program can be a time-consuming and intimidating undertaking, especially for businesses new to the game. Following our eight-step process will prepare you to tackle all the tasks, but you can start with a few lower-touch entry points such as the content roundup. As Chad Pollitt describes, the content roundup involves collecting the thoughts of several industry influencers on a given topic and compiling them into a blog post (or some other form of content). Chad also shares the checklist below, which outlines everything involved in executing the technique successfully. Following the above advice will give your content a strong strategic and creative foundation, but that doesn’t mean your job is done. You need to continually evaluate, strengthen, and grow your content kingdom by identifying what’s working, adjusting what isn’t, and amplifying your content’s power through strategic optimization. 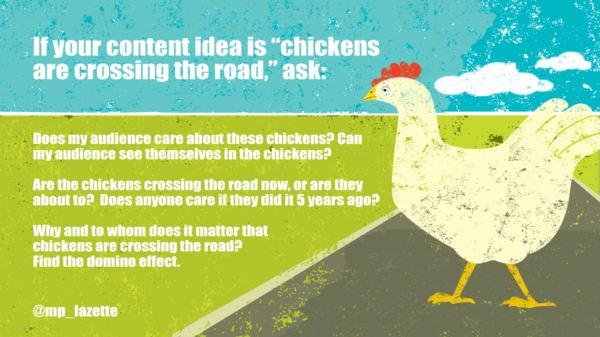 It’s not enough to create and distribute the content you think your audience will want to read. You must demonstrate that your content is making a measurable impact on the bottom line by driving readers to take action with your brand. Of course, not all of the above metrics will be meaningful when determining the ultimate measure of success for content marketing initiatives: ROI. Open rates from email show whether your titles or subject lines resonate with your audience. Click-through rates (CTR) from your website content and email campaigns can identify consumers’ willingness to answer calls to action and help you understand how customers move through your content. Time spent. If time-spent figures are changing, it’s worth examining why. Invitations to contribute at in-person events, in writing, or by making appearances on videos or podcasts are an indication of thought leadership. Results from research and surveys about your company provide a body of information to track over time. 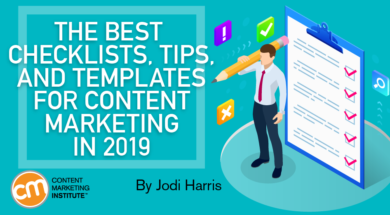 While these tips, tools, and templates will help you tackle many of the challenges involved in successful content marketing, they’re no substitute for a thorough understanding of the principles and techniques they represent. If you have questions or would like additional insights on any of these topics, let us know by adding a comment. Want to immerse yourself in content marketing and gather with thousands of your fellow content marketers? Register by the end of 2018 for the lowest rates for Content Marketing World 2019!